VAN ALLEN AND HOLLY ON CROSSCURRENTS, 9/7 – Doggedly Yours… Howling, Humor, and History. 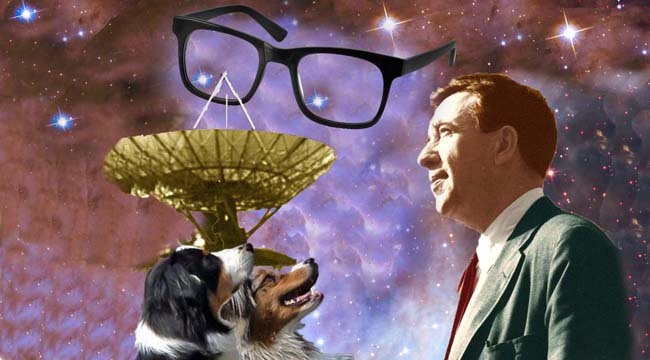 VAN ALLEN AND HOLLY ON CROSSCURRENTS, 9/7: The star gazing Royal Astronomical Society Medal recipient, James Van Allen, and star rocking Hall of Fame inductee, Buddy Holly, share this date as their birthdays from 1914 and 1936 respectively. Gavin and Wyatt look up to the scientist as Van Allen observes an image of Holly’s eye glasses in the night sky. You can help celebrate the dual birthdays of Van Allen and Holly by listening to Crosscurrents, 9/7 at 8 a.m.